In 1959, Stewart Sharpless from the US Naval Observatory published his second Catalog of HII regions in the galactic plane, Sh 2. His 1959 paper extended previous work from1953 (Sh 1) and comprised 313 individual HII regions north of declination -27°. Sharpless used a very broad definition of the term "HII region", leading to the inclusion of several planetary nebula, supernova remnants, and reflection nebula. The final catalog was based on the POSS survey plates. In his compilation, Sharpless categorizes the single HII regions in terms of several parameters, such as Diameter, Form (circular, elliptical, irregular), Structure (amorphous/filamentary), Brightness, and number of associated stars, which are further discussed in terms of their spectral classes. The distribution of the HII regions is analyzed and the orientation of the galactic plane is determined, using the HII regions as markers. Most of the Sharpless objects are distributed along the galactic plane, corresponding to the Milky Way in the sky. My first contact with the Sharpless Catalog was in autumn of 2004, when I observed the first "true" Sharpless objects, i.e. those that have no NGC or IC designation. Among these were Sharpless 91, the long SNR filament, Sharpless 101, the tulip nebula, and Sharpless 102 in Cygnus , Sharpless 129, the big crescent in Cepheus, Sharpless 132 and Sharpless 155, the Cave Nebula in Cepheus, and many more. 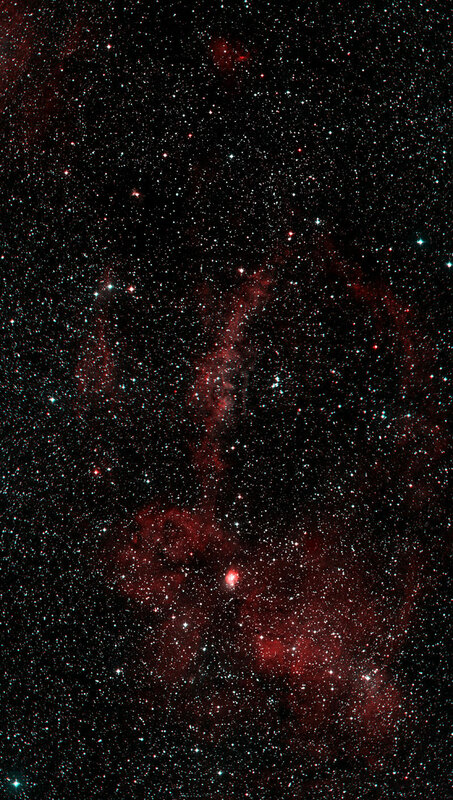 The one that hooked me was, however, Sharpless 157 at the border between Cassiopeia and Cepheus, close to the Bubble Nebula (image at top). 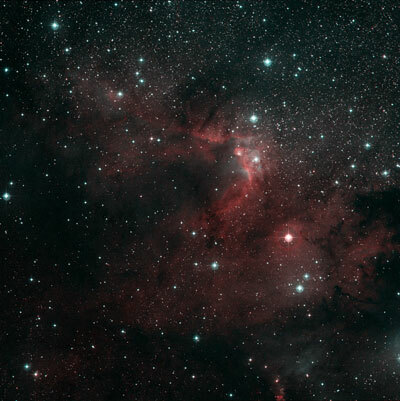 I became aware of this nebula by Richard Crisp, who was one of the first at that time pioneering in making emission line composite images, by his composite of Lynds Group 11, including Sharpless 157 and others, which he just published at that time. When observing Sharpless 157 with my 14-Inch Dobsonian and OIII filter, I was really surprised how bright and well defined this HII region was. From that time on, I started exploring the Sharpless Catalog. First I used mainly the information offered by Jim Shields and Steve Gottlieb on their Adventures in Deep Space here, but later on, I started to compile my own observing material, which finally became the Sharpless Observing Atlas. In the meantime (2012), I have observed (or at least tried to observe) more than 200 of the entries. 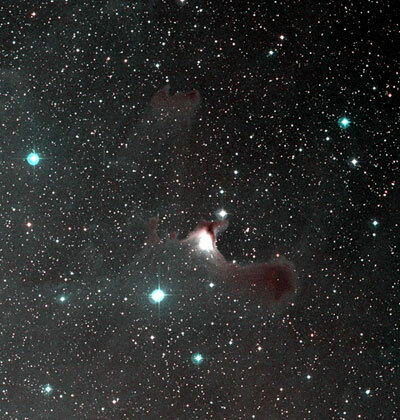 For the observing amateur, the Sharpless catalog is a treasure box of visual observing targets of emission nebula, going well beyond that offered in Messier's list or Dreyer's NGC/IC. Though emission nebula of Messier and NGC/IC are included, the Sharpless catalog contains mostly entries that are not covered by those compilations and include in particular large HII clouds with low excitation. Here comes the difficulty for the visual observer. Unlike the CCD crowd with their H-alpha sensitive detectors, our eye has only very low sensitivity for the red H-alpha line, which is detected mostly by the red-sensitive cones, which, as the other cone pigments, do not have the same extent of dark adaptation as the green-sensitive rod cells (see here). Therefore, we have to rely on the OIII lines at 496 and 501 nm as well as the H-beta line at 486 nm. In particular for the low-excitation entries of the catalog, the OIII intensity is marginal and the best chances for a successful observation are in the H-beta line. Besides an OIII Filter or a narrowband UHC covering both OIII and H-beta emission lines, a pure H-beta Filter, as those of Lumicon or Thousand Oaks, is recommended for the pure HII regions (here you will find more about filters). But even equipped with the proper filter, many of the Sharpless objects are difficult or impossible to observe visually, owing to their low intensity, their partly very extended character, and the inherently low contrast. 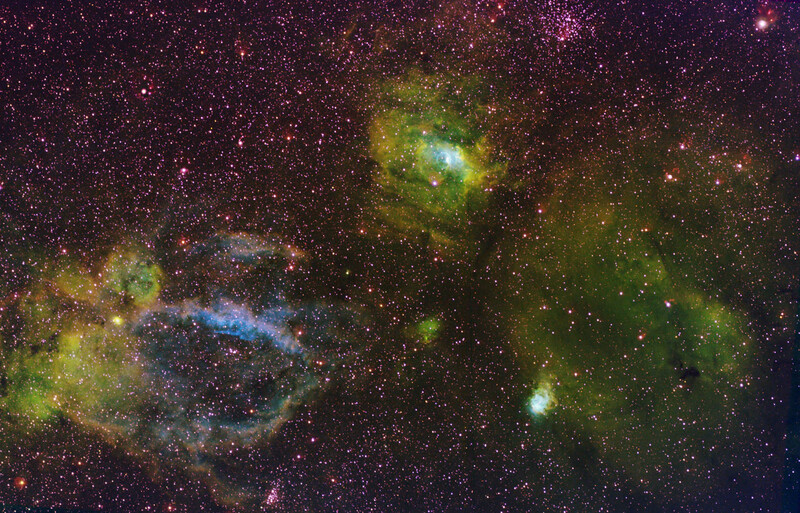 Besides the true HII regions, there are also many "misclassifications" in the Sharpless Catalog, such as reflection nebula (often in connection to HII emission nebula), large planetary nebula, supernova remnants, Wolf-Rayet-Bubbles (such as Sh 308 to the right), or the two Maffei galaxies. This, however, does not impede the fun of observing them. Due to their in part extreme sizes over several degrees, many of the larger Sharpless nebula are particularly suited for observing with smaller telescopes. These objects, however, often require dark transparent skies. For instance the California Nebula or Barnard's Loop are much more distinct in my 80 mm finder (equipped with UHC filter) than in my 22" Dob. For the Observing Atlas, I scanned the digitized POSS plates and used the compilation of Kevin Jardine at GalaxyMap, who has put together an incredible collection of information about our galaxy. 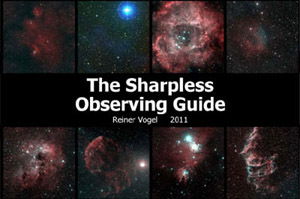 Also very helpful were the broad band and emission line photographs of Dean Salman at www.sharplesscatalog.com. The first version of the Observing Atlas did not cover the Sharpless Catalog completely. Rather, it was a selection of those objects where there is at least a marginal chance of visual observation. In the meantime (2012), I expanded the atlas to 305 of the entire 313 objects. I found that many of the small, compact and (on the DSS) bright objects, that often were partly reflection nebula, were difficult to not visible, while several of those very large, dim, low contrast entries of the catalog were relatively easy. 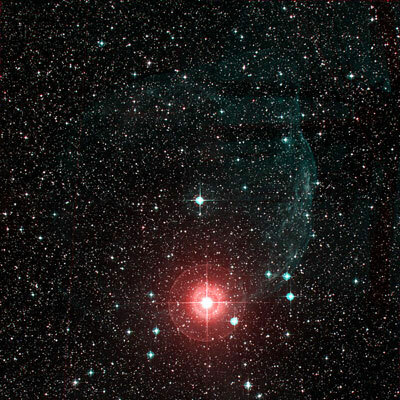 In the Sharpless Observing Atlas, a 60x60 arcminute DSS image is shown for each object, which was derived mostly from the POSS II red plates (blue plates if the object is mostly a reflection nebula). This area is large enough to locate the field using the Sky Atlas 2000 or Uranometria. Below are close ups from either the blue or red POSS II plates, to give you a feeling about relative HII and OIII intensities. 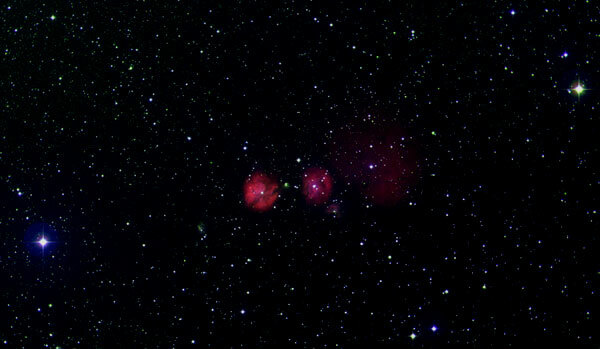 In addition, there are POSS II composites from Kevin Jardine's site or narrowband images from Dean Salman and others. The data table comprises the coordinates (in 2000) and the original Sharpless classification entries for diameter, form, structure, and brightness. This is followed by a short description from Kevin Jardine's website and my notes of those objects that I have observed or at least tried to observe. For each page, there are two finder charts with 20° and 5 ° field of view. You can print the atlas double-sided, such that you have the description on the front page and the finder charts on the back side. If you prefer to have the two pages facing, delete the empty page after the introduction. Updated 2012 version, covering 310 of the entire 313 entries.